Despite his campaign rhetoric, Donald Trump has yet to demonstrate an appreciation for law and order. Today's brazen disregard for the function of the country's highest law enforcement body (Federal Bureau of Investigation) is the last straw. Without notice or a viable reason, Trump fired James Comey, Director of the FBI, making this the first time in U.S. history an FBI director was fired by the president he was investigating. Comey was only three years into a ten-year term, and his firing is yet another reminder of the importance of elections. November's election not only propelled an anti-intellectual, political neophyte to the White House, it legitimized the demagoguery and propaganda of a dangerous pseudo-fascist. FBI directors serve ten-year terms to prevent partisanship from infiltrating jurisprudential decision making. If Bureau directors were made to fear termination because their investigations embarrass the White House, they would never be able to operate effectively. Attorney Gen. Jeff Sessions recommendation to Trump to relieve Comey of his duties as head of the FBI. The United States and its once-thriving democracy were considered a beacon of hope and a symbol of freedom to the world. Trump's actions are intentionally destroying the democratic traditions that established that beacon. This firing skirts the law and every principle of justice and fairness generally associated with our understanding of America. To put it plainly, this does not happen in the United States! This method of purging political and investigative watchdogs is not only anti-democratic it's anti-American. Similar to officials being barred from imprisoning people for investigating their wrongdoing. Officials ought not to have the authority to remove heads of investigative bodies; especially when those heads are actively investigating the individual pursuing their removal. This is not a difficult concept to comprehend. But Trump and his political lapdogs do not care about right and wrong. Trump ousting Director Comey amid speculation of Comey's Russian investigation is the height of government corruption and it reeks of coverup. Clearly Comey was stumbling on damning information that would more than undermine the White House. It could potentially force a resignation from the chief executive. 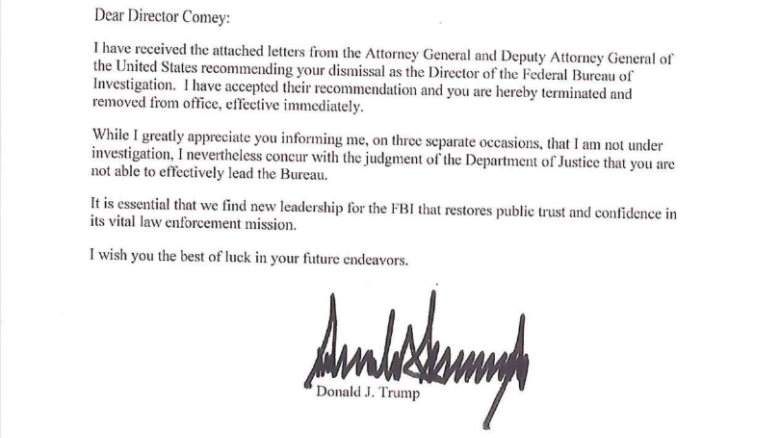 Trump allegedly based his decision to fire Comey on the recommendations from Attorney General Jeff Sessions (letter found above) and Deputy Attorney General Rod Rosenstein. He explained his reasoning as merely following the directives of Sessions and Rosenstein. In his letter to Comey Trump claimed, "I concur with the judgment of the Department of Justice that you are not able to effectively lead the Bureau." However, in their letters, Sessions and Rosenstein focused on Comey's poor handling of the Clinton email investigation. If Comey was removed because of his alleged handling of the Clinton email investigation, there is no credible reason for Trump keeping him in that position till May 9th rather than firing him on January 20th. This is not just taboo, or absurd, or corrupt, or bad politics – this is fascism! Only under fascist regimes do law enforcement officials get punished for enforcing the law against government officials. Contrary to Trump's beliefs/actions, he is not above the law. As 10th graders learn in civics class, two central principles of the U.S. government are Limited Government and Separation of Powers. Our government is built on these pillars upholding its democratic foundation. But, when the White House circumvents limits to its power by ousting investigators of government corruption and treason, the breakdown in government is so great that it renders the country devoid of central authority. Sadly, the U.S. Senate remains the final defense to preventing the country from devolving into fascist obscurity. Trump will inevitably nominate Comey's replacement. The Senate will be tasked with confirming or rejecting that nominee. The Republican Party appears poised to promote cowardice and encourage this behavior from their standard bearer by rubber stamping whomever Trump decides to nominate. The position of FBI director is supposed to be non partisan. But if past is prologue, not only will Trump replace Comey with an inexperienced partisan, Trump will replace Comey with a Steve Bannon like character who will forever change the function of the Bureau by abusing power and threatening retribution for non compliance. Nothing in Trump's tenure or rhetoric gives the impression that Comey will be replaced by a deserving or competent investigator. Demanding a private independent investigation should be the only message emerging from the Democratic Party after Trump's legally questionable power grab. It is the responsibility of the American public to hold the Trump administration accountable for its corruption. Citizens of good conscience cannot grow weary and throw their hands in the air, or duck their collective heads in the sand. To consider Trump's decision morally repugnant would be apt. But do not allow Trump's anti-democratic sideshow to become commonplace.